With concerns over job losses in major industries, the tourism sector has shown some resilience in the face of a tough economic climate. In 2017, the sector had its most successful year of job creation in recent times. The tourism sector created 31 752 net new jobs in 2017. This is the most number of net new jobs generated by tourism within a year in at least the last eight years. 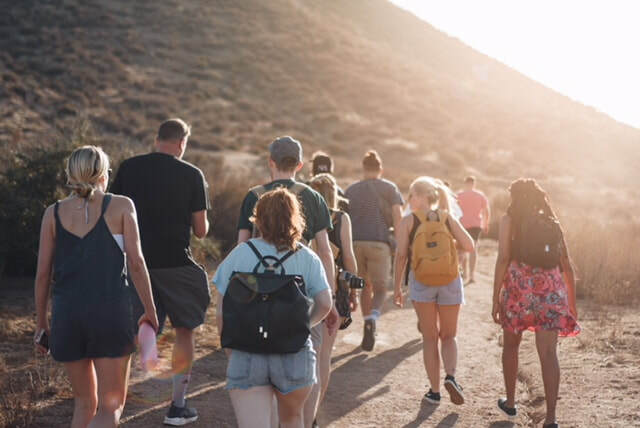 This also represents the second year of employment growth after the sector saw a net loss of 12 262 jobs in 2015, according to data from the latest Tourism Satellite Account for South Africa. Road passenger transport was responsible for the bulk of tourism jobs created in 2017. The industry generated 16 676 net new jobs, followed by accommodation and air passenger transport. However, rail passenger transport, the cultural industry, and the food and beverages servicing industry all lost tourism jobs during the year (click on the infographic to enlarge). A longer-term analysis of labour statistics shows that the tourism sector is playing a larger role in job creation than other major industries. In the last four years (2014–2017), tourism created just over 64 000 net new jobs, outperforming larger industries such as transport and communication, mining, utilities (electricity, gas and water) and manufacturing.2 The finance and other business services industry was the largest contributor to job creation overall, increasing employment by about 407 000 jobs during 2014 to 2017. In 2017, one in every 22 employed people in South Africa were working in the tourism sector, totalling 722 013 individuals. This represents 4,5% of the 16,2 million people in South Africa’s workforce. 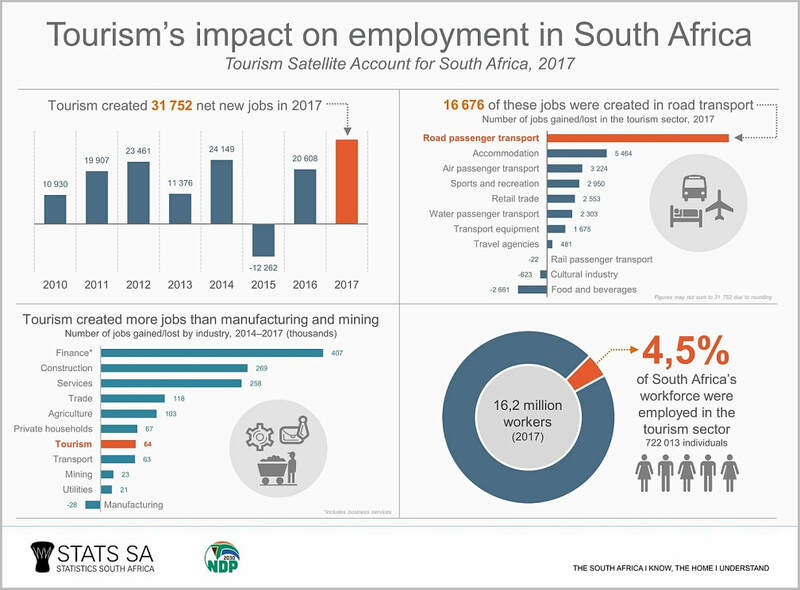 About half of those working in the tourism sector were employed by two industries: road passenger transport and the food and beverages servicing industry. President Ramaphosa, in his State of the Nation Address in February, stated that tourism provides our country with “incredible opportunities to, quite literally, shine”.3 Acknowledging that tourism performs better than many other industries, the President further stated that there is no reason that tourism employment shouldn’t double in size. The tourism sector contributed 2,8% (or R130 billion) to South Africa’s gross domestic product (GDP) in 2017, making it larger than the agriculture, forestry and fishing industry. Of the 14,97 million non-resident visitors in 2017, 4,69 million (or 31%) were same-day visitors and 10,28 million (or 69%) were tourists. International visitors were responsible for 44% (R121 billion) of total tourism spending in 2017, while domestic visitors contributed 56% (R156 billion). Total tourism spending amounted to R277 billion. Download the latest Tourism Satellite Account for South Africa report here.